Camp will not only introduce children to new techniques and mediums, but also allow them to embrace the freedom of expression in a fun and inclusive environment. 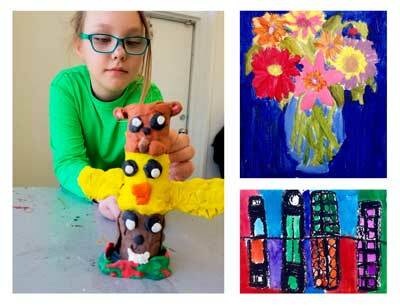 Acrylic paint, watercolours, clay, paper mâché, mosaics, cartooning, pen and ink, puppet making, and wire sculptures are among the many mediums that will be explored throughout the week. Thank you for joining us in 2018! Further information on March Break Camp 2019 will be available closer to the date. All art supplies are included in the price of the weekly program. The full-day programs run on a weekly basis from 9:00 am to 4:00 pm. additional fee (contact us for details regarding this option). Children must bring their own lunch and snacks. Children are encouraged to bring clothes that they can get messy. PA days are structured in the same way as our camp programs. Children will spend the day working with different media, learning new techniques and creating fun and engaging art projects. PA Days run from 9:00 am to 4:00 pm and are available for children ages 6-12. The cost is $60.00 + HST and includes all art supplies. Before/after care (8am-9am and 4pm-5pm) is available for an additional fee. Please contact us if you are interested in this option. Please call for more information regarding dates.